"This recipe uses canned chicken, but if you want to use leftover chunked chicken or turkey, it 's even better. A dab of sweet relish is a nice taste surprise, and we love the apples, pecans, and raisins. The creamy salad dressing finishes it off nicely." 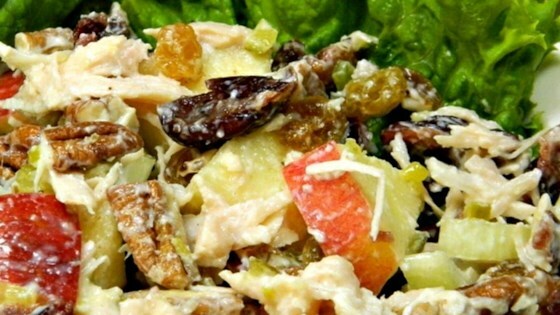 Mix chicken, apple, raisins, celery, pecans, yogurt, and relish together in a bowl; season with salt and pepper. Cover bowl with plastic wrap and refrigerate until chilled, at least 30 minutes. Cucumber is an interesting substitution possibility for the celery. Use leftover chicken or turkey in place of the canned chicken to make this even better, if you have it on hand. I used leftover rabbit for the chicken. I didn't have yogurt so used sour cream and subbed the pecans with walnuts. It's very tasty.